About 15 minutes after walking out of Porchlight Music Theatre’s sold out performance of Billy Elliot, a friend turned to me because we both had not spoken a word since leaving the theatre. Sitting over a glass of wine at a nearby bistro, I told my friend that all I feel right now is grace. A tear formed in his eye as he agreed. What director/choreographer Brenda Didier has created for Porchlight’s robust move downtown to the Ruth Page Center For The Arts will live in the history books as one of the great works of Chicago theatre. Ms. Didier takes Billy Elliot back to its roots where the musical now feels closer to its 2000 origin film than any of the stage versions. With music by Sir Elton John and book/lyrics by Lee Hall, Billy Elliot tells the story of a family living in working class Northern England whose matriarch dies leaving the men of the family struggling to find connection while dealing with a national coal miners strike with threatens to leave many bankrupt. As the play starts we find eleven year old boxer-Billy finding by happenchance that he drawn to the grace of ballet and more importantly, he is a natural. The stereotyping of dance in a blue collar neighborhood and family take hold as the play brilliantly deals with how art can heal a broken soul and family. 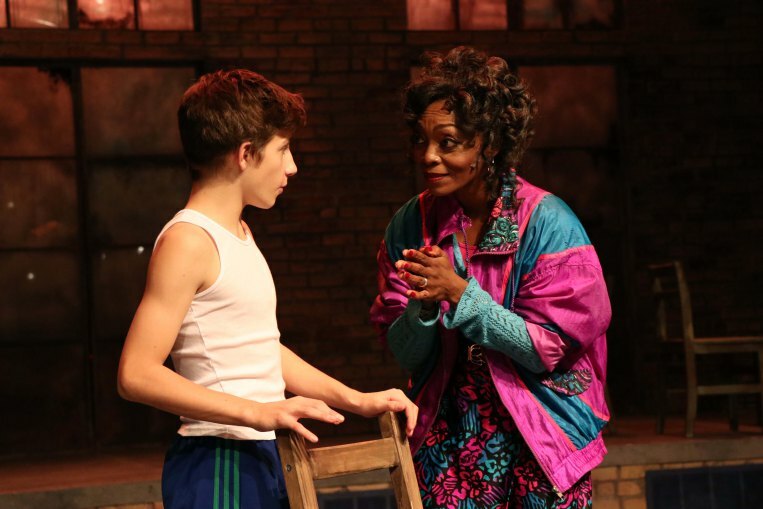 The success of Billy Elliot rests squarely on the shoulders of the young lead and in casting, Lincoln Seymour (and alternate Jacob Kaiser), Ms. Didier has almost insured the shows greatness. Mr. Seymour is by far the finest Billy I’ve seen, be it on Broadway or several national tours. He exudes everything one would expect in the character, including a vast blackness of hurt that would come from the loss of a mother (beautifully portrayed by Nicole Cready). When it’s time for his big number number, Electricity, which he explains what dance feels like in his soul, it his truth as no other Billy has been able to convey to an audience. This exposes Billy’s core also explains his love his best friend, Michael (a spot on performance by Peyton Owen). The supporting cast of this phenomenal production (totaling thirty) is also something to behold, with groundbreaking performances from some of Chicago’s most seen actors. Sean Fortunato is otherworldly as Billy’s dad, with a dark, sad, one step away from self-injury quality that makes the audience weep for his position. Adam Fane (whose performance as Rob in Avenue Q is still one of this website’s greatest memories) knocks it out of the park as Billy’s older brother, and is, at its surface, atypical casting that is a gift that keeps giving. Iris Lieberman’s lovingly portrayal of Grandma crystallizes the bridge between family and dance. And if there is ever an award winning performance, than Shanésia Davis as Billy’s ballet mentor, Mrs. Wilkinson will walk away with all available. Much credit must also be given to musical director Linda Madonia who has nicely augmented John’s score for the Ruth Page, while Christopher Rhoton’s minimal, industrialist set proves the perfect backdrop for the story while co-choreographer Craig V. Miller mirrored Didier’s vision. Billy Elliot marks a new era for Porchlight Music Theatre as it embarks its quest in the Gold Coast. If this show is any indication of what is to follow, then downtown Chicago has just added a game changer. Visit Theatre In Chicago for detailed show information and review round up.